This pillow comes in peace! 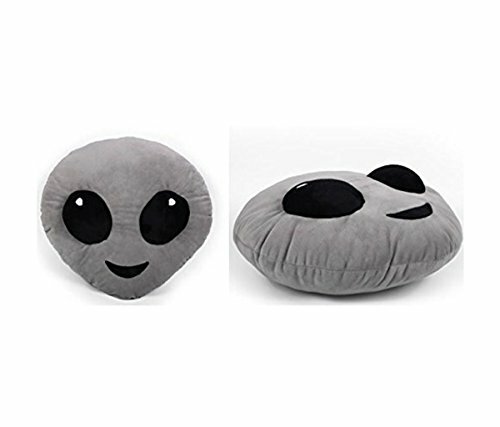 Your favorite emoji now becomes your favorite pillow with this Grey Alien Emoji Pillow! This pillow features large bulging eyes and is shaped after the Alien Emoji! You'll love snuggling up with the super soft and comfortable plush. Will make a great accent on your bed or in your living area. Spot clean only. 14 x 14 inch. Cuddle up with your favorite emoji! Will make a fun home accent in your bedroom or living area! This pillow is perfect for emoji fans of any age! Perfect way to express themselves. This fun & expressive pillow is made from high quality thick & super soft plush fabric. Perfect to snuggle up with! You can be sure that it's high quality feel will always stay soft, plushy & will be a conversation with everyone. Spot clean only.